We offer Inmark Electro-Mechanical Table Top Coder, which is used to print statutory information on various objects. 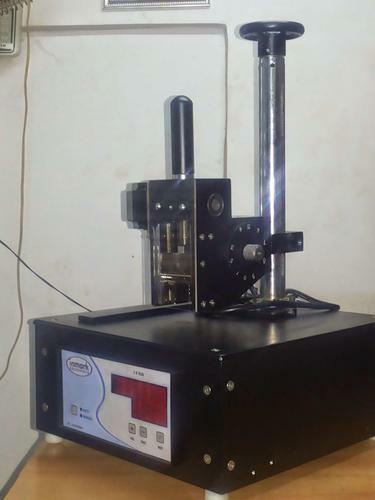 This machine is suitable to print on things like Batch No., Mfg. Date, Exp. Date and MRP. Further, independent pouches, containers and labels can also be printed. The machine is operated with the help of stepper motor as well as programmable logic controller (PLC). Backed by 10 years of experience, we Inmark Equipments are engaged in offering a wide range of Coding Machines, Ink Cartridges and Coding Inks. This range includes Vertical type pneumatic coder (Top coder), Electro mechanical table top coder, Line extension coder, Aluminium body cartridges and Mechanical online coder inmark. With the help of our efficient workforce, we also offer Dry coding machine (Hot Ink Roll), Antifreeze coding ink, Soft non-porous cartridges, Inmark hand operated coder and Online coder. These are appreciated for durability, optimum strength and excellent performance. We have a team of professionals, who are expert in designing, developing, customization and installation. To meet the requirements of our clients, we offer customization in our coding systems. In addition to this, we design various other systems like collating, stack printing, vacuum lifting, blister tablet recovery systems, line extension coder inner and outer carton path guide systems and conveyors. With the help of our excellent logistics capabilities and customer friendly approach, we have been able to build a large client base in domestic as well as in international market.